Awwwwww yeaaaaaahhhhhhhhhhh. Coaches film was available early. I am using very generic terminology. I have no idea what each team calls their specific formations, positions, or roles. I am just using basic terms to explain the plays to an average fan. 1st and 10 at WSH 12 - R.Griffin pass deep left to P.Garcon for 88 yards, Touchdown. The Redskins are in a Balanced 2 TE Singleback formation. The Saints have their base 4-3 personnel in. Malcolm Jenkins is playing in the box. Roman Harper playing middle deep. Corey White is lined up on Pierre Garcon, Patrick Robinson is lined up on Josh Morgan. TE Fred Davis motions to the right, making it a Strong Right 2 TE Singleback formation. The Saints adjust, Patrick Robinson backs off his coverage on Josh Morgan on the weak side and Corey White moves closer to the line towards Pierre Garcon on the strong side. All 3 LBers shift left towards the strong side. The ball is snapped, Jenkins is blitzing, Fred Davis stays to block while Niles Paul goes to the weakside flats as a check down option. 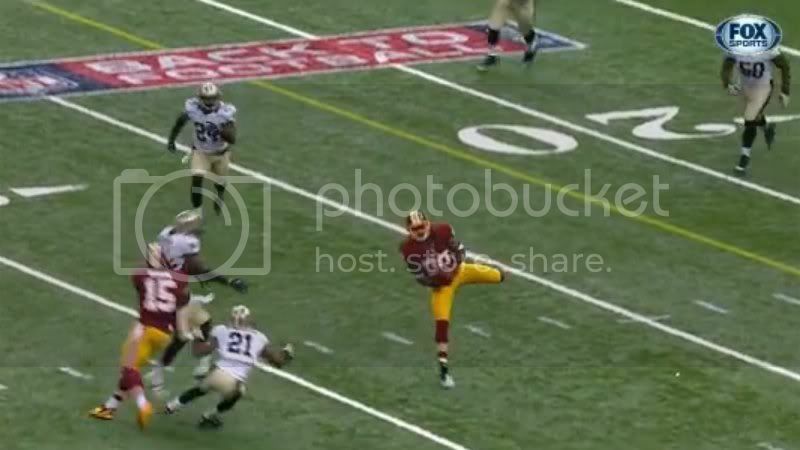 Robert Griffin fakes a handoff to Alfred Morris, who also stays to block. White is in zone coverage outside and behind Garcon, Robinson is in zone coverage over the top of Morgan, Harper is in a deep middle zone. The linebackers and defensive linemen are near the LOS to defend the run or checkdown. The ball is thrown, Robinson is in good position on Morgan, Harper is moving in on the play away from his deep zone, White is seemingly lost in coverage. Garcon makes the catch and Roman Harper is already out of position to make a tackle because of his poor pursuit angle. Morgan shoves him and knocks him down, completely removing him from the play. It's not likely Harper would've been in position to make a play, but Morgan sealed the deal. After reviewing the play from multiple angles, multiple times, I do no believe Morgan committed a hold, or offensive pass interference. It was a clean play. White is too far away to make a play on Garcon, and Robinson pursues Garcon after the catch, unsuccessfully. 2 mistakes by the Saints secondary. 2) Roman Harper took a bad angle. I expect better from a 7th year vet. His bad angle allowed Morgan to easily take him out of the play, all it took was a slight shove in passing and Harper was completely out of the play. Both Jenkins and Harper have been showing bad pursuit angles all preseason, and it carried into the 1st game. I don't really know why Spagnuolo chose to put Harper in coverage while blitzing Jenkins. Harper led all DBs in sacks last season, and Malcolm Jenkins has been better in coverage in the past. Hopefully it's something they notice when reviewing the tape. 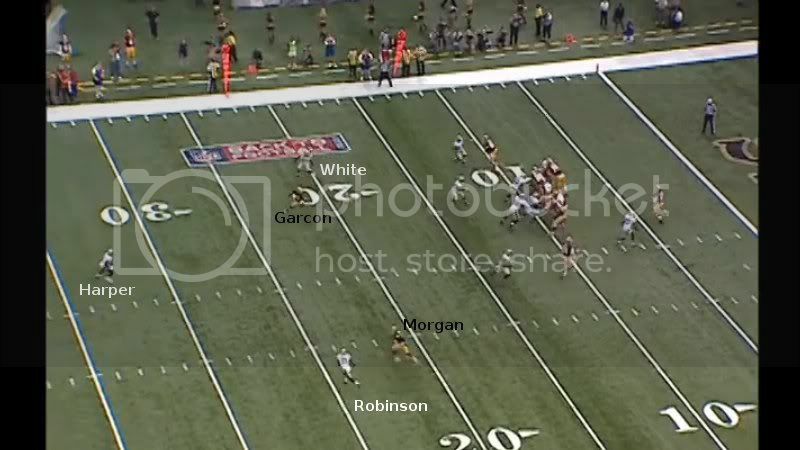 I also don't know why Robinson wasn't on Garcon, with White on Morgan. Patrick Robinson played this perfectly. He was in great position on Morgan the entire time, and he nearly made the play on Garcon as well. This play falls on White and Harper. It was a good play, executed perfectly by the Redskins. Even if Harper had taken a better angle, it likely would've still gone for 15-20 yards. Great job man. I definitely appreciate the time you took to do this. Youre very good it it. Keep it coming! This is fantastic work Ty. Between this and the Cam Jordan tracker, your really pumping out some quality info. Hope you keep it up! Thanks again buddy! a) 15:00 2nd - Down 3 - 2nd and 9 at NO 45 - R.Griffin pass deep right to F.Davis pushed ob at NO 19 for 26 yards. b) 7:59 2nd - Down 10 - 3rd and 6 at NO 48 - R.Griffin pass deep left to S.Moss pushed ob at NO 21 for 27 yards. c) 9:18 3rd - Down 6 - 2nd and 19 at WSH 45 - R.Griffin pass short left to A.Robinson pushed ob at NO 26 for 29 yards. No problem! Thanks for the compliments. Whilst i sit here, irritated that i don't have Game Rewind (seriously, as much as we pay for the NFL package, it should be enough. NFL likes to squeeze every dime they can get out of people), i would like to add to what you said. The Redskins come out in what we call a crown (by the way, when i say we, i'm referring to my three roommates and myself, who all play football), where essentially the formation is symmetrical. There are multiple variances like the right crown (Gun, RB right), the left crown (Gun, RB left), the 4 crown (Center, 4 WR, RB straight back), etc. Back to the point, the 'Skins come out in a base crown. 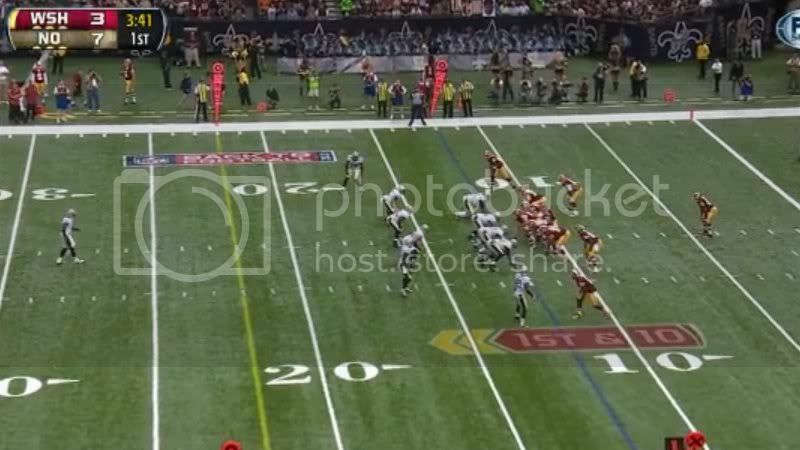 I don't know what particular NAME the Redskins have for the play, but what happens is Garcon runs a "normal" post route, like what you would see in Madden. On the flipside of the formation, Morgan is running a skinny post route, which basically means his break is lighter than Garcon's and is more focused towards the middle of the field than the outside. 'Skins call a max protect assignment. Niles Paul runs to the flats, as TD said, on a checkdown route. Garcon and Morgan run the routes listed above. This all culminates into what is called a play action stretch "pick". Play action, obviously, comes from the fake hand off. The stretch is from the fact that Garcon and Morgan are both running deep routes. And the "pick" is what kept any Saints' defenders from making a play, as Morgan was essentially "just in the way" of the DBs. Brilliantly executed by the Redskins offense. I coach middle school football and we just call it a "Dual TE" formation, move Griffin Back with the RB at the left or right and you've got a "Dual TE Right" or "Dual TE Left." I know, I know, we are bubbling with creativity. Great point. I focused more on what our DBs did, rather than what the offense did, but what you pointed out there is what makes the play work. Yep. I tried to stay away from calling it a pick play, because most people think of a pick play as an illegal play, because many times the WR makes the "pick" before the other WR has the ball. Since Morgan made the "pick" after the catch was made, I chose to call it a block. You're right though, it's a "pick" play ran in a legal way, to perfection. What's coaches film? Does it cost money? All-22 film. Costs $70 for every team, every play, you get it with the gamerewind package. You can get just the Saints for like $40, but you only get select plays, not full games. I'd rather pay the extra $30 and get it for every play of every game, as well as the ability to watch every game every week. You could do that with the Saints package. I think it's only 40. I was unclear, when I said you only get select plays, I meant you only get select plays of coaches film. You get all the plays of standard film. So am I, not only that, but I'm saving up for my wedding. I had to sell some stuff. OT but your engaged?! That's great news! Congrats bud! Some girl doesn't know how lucky she is. On the play, what I don't get is why Jenkins is blitzing instead of Harper(as you said). Harper has shown he can blitz, and in coverage is at best average(on a good day). Jenkins is actually good in coverage. That makes no sense to me. I also think Robinson is partially to blame on the play. I know he was covering Morgan, but it seemed like after Garcon caught the pass he might have over played? It was just a massive cluster bomb play by the secondary.